Urgent action was needed when a badly damaged rising main started releasing sewage into a river used for pleasure cruising, rowing, and fishing. United Utilities called on Selwood when the problem in the River Irwell in Clifton Park, Manchester, came to light on a Friday afternoon. The problem was complex – the park needed to be kept open to the public and the pipe needed to be bypassed but the only places where the connections could be made were 370m apart on opposite sides of the river. A suitably-sized pipe could not be found from UK suppliers at short notice, so Selwood staff used their network of contacts to source one from Europe. While waiting for delivery, Selwood planned the entire operation – mobilising installation teams and preparing all the necessary equipment and labour. 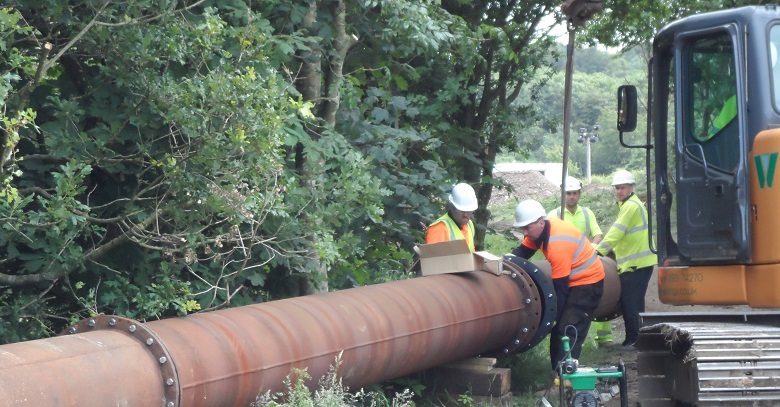 When the pipes arrived at Sunday lunchtime, the teams were fully briefed and ready to carry out the installation, using a public footbridge to set the pipe across the river. The forward planning, specialist knowledge and commitment of the Selwood teams were crucial in ensuring pollution to the river was minimised with as little disruption to the public as possible.